10,000 years ago when the ice age ended, deep pond like areas were left in the landscape. Over time these became water logged and filled with vegetation that eventually transformed into what we know today as Bog. There are two types of bogs found in Ireland. 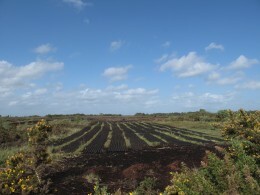 Raised Bog is found mostly in the Irish midlands and was formed as described above. There is also another type called Blanket Bog and these are mostly found in mountainous areas around the coast. Blanket bogs are like carpets of peat. During the Bronze Age with the arrival of new tools the process clearing the forests began. The practice of burning the vegetation also prevented new plants from growing again. Over time the land became water logged and the transition to bog began. Actually one sixth of Ireland is covered by bog, that's almost 2.5 million acres! After the sods are cut they are stacked to dry in the sun! Most homes used the dried turf as their only source of fuel!